Our stainless steel carriage bolts are available in both 18-8 and 316 stainless steel. (Use 316SS for salt water exposure). Carriage Bolts have a square shoulder under a round or domed head, without a drive, and are used with a nut and washer. The shoulder of the carriage bolt pulls into the wood when tightening and prevents the bolt from turning. Bolt length is measured starting under the head and finishing at the tip of the bolt. 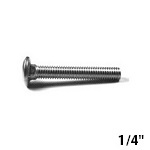 Carriage bolt lengths of 4" and shorter are fully threaded. 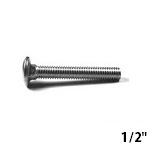 Depending upon the manufacturer, stainless steel carriage bolts over 4" may be fully threaded or have a smooth 2" or more between the head and beginning of threading. Diameters up to 3/4" available — contact us to get a quote.